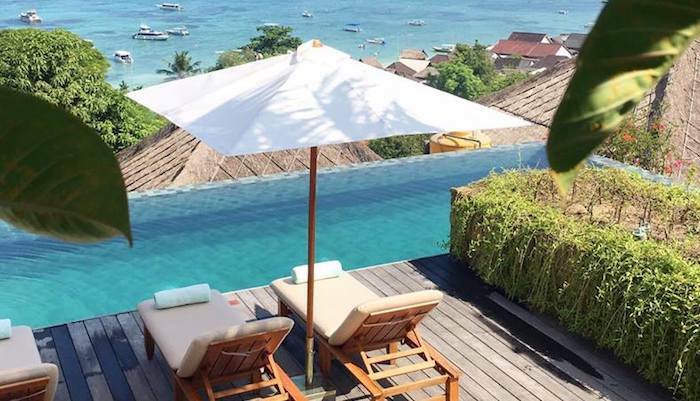 Mahagiri Resort Nusa Lembongan has 80 rooms or suites, all with views over the beach, the tropical gardens or over the village. The resort also has 12 beautiful villas, 4 are one bedroom private pool villas and 8 are one bedroom lagoon pool villas that all share a huge swimming pool running the length of the villas. All rooms, suites and villas also have full access to the shared resort pools in the beach club. Reception is open from 7am to 11pm plus transport available for pick up and drop off around the island. There is also an activities desk in reception to help you plan tours or adventure all around the island. The beach club is open for breakfast, lunch and dinner with breakfast starting at 7am and the bar closing at 10pm Sunday to Friday, and open until 11pm on Saturday. The kitchen takes last orders at 9.30pm Sunday to Friday and 10.30pm on Saturday. Room service is available. 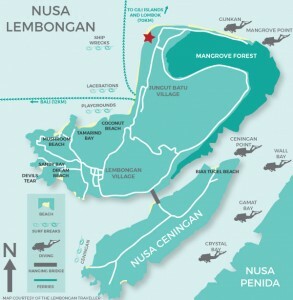 The beach club sits on the widest white sand beach on Nusa Lembongan, which has been named Mahagiri beach. There are 2 fresh water swimming pools with sun loungers and day beds, plus bean bags on the beach close to our beach bar. We can also assist with the hire of motorbikes and bicycles, and there is 24 hour security. Our beach front, garden and village view rooms all have king beds or are twin share, subject to your request and availability. Every room has a 32 inch LED TV with international and local channels. You will also find tea and coffee available in the room, plus a secure safety deposit box, mini fridge and hair dryer. Every room has air-conditioning and we provide accessories such as soap, shampoo, conditioner, moisturiser, tooth brush, shower cap, vanity kit, comb and slippers. Our Beach Front, garden and village view suites all have king beds. Every suite has a 32 inch LED TV with international and local channels. You will also find tea and coffee available in the suite, plus a secure safety deposit box, mini fridge and hair dryer. Every suite has air-conditioning and we provide accessories such as soap, shampoo, conditioner, moisturiser, tooth brush, shower cap, vanity kit, comb and slippers. The suites also offer a sitting area with a sofa and coffee table, plus the TV can swivel to the dining area as well. The dining area has a table with chairs. Our village view family room has a King size bed and a single bed subject. Every room has a 32 inch LED TV with international and local channels. You will also find tea and coffee available in the room, plus a secure safety deposit box, mini fridge and hair dryer. Every room has air-conditioning and we provide accessories such as soap, shampoo, conditioner, moisturiser, tooth brush, shower cap, vanity kit, comb and slippers. Our one bedroom lagoon villas all have king beds with an optional trundle bed built in. Every villa has a 32 inch LED TV with international and local channels. You will also find tea and coffee available in the villa, plus a secure safety deposit box, mini fridge and hair dryer. Every villa has air-conditioning and we provide accessories such as soap, shampoo, conditioner, moisturiser, tooth brush, shower cap, vanity kit, comb and slippers. The lagoon villas have large bathrooms with bathtubs. 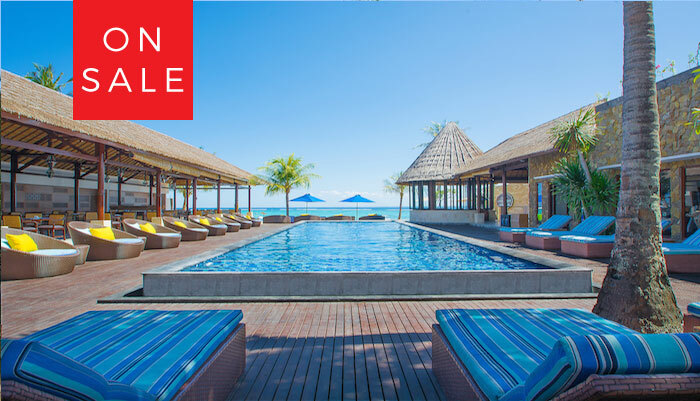 All the lagoon villas have direct access to the shared 42 metre lagoon pool, that is shared amongst 8 villas in total. The villas also have access to the beach club pools. 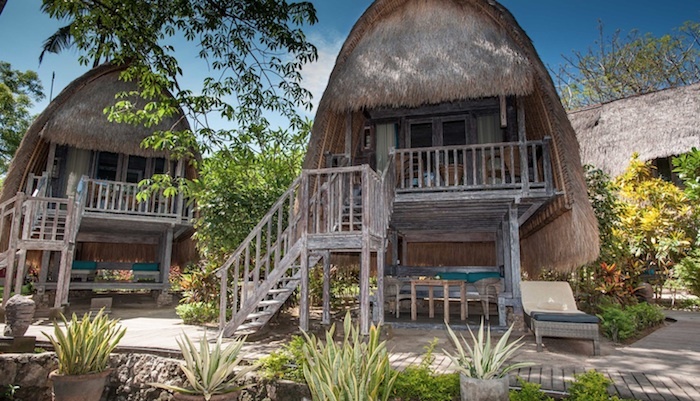 The lagoon villas can all be inter-connecting for family bookings or large group bookings. Our one bedroom private pool villas all have king beds with an optional trundle bed built in. Every villa has a 32 inch LED TV with international and local channels. You will also find tea and coffee available in the villa, plus a secure safety deposit box, mini fridge and hair dryer. Every villa has air-conditioning and we provide accessories such as soap, shampoo, conditioner, moisturiser, tooth brush, shower cap, vanity kit, comb and slippers. The private pool villas have large bathrooms with bathtubs. All the private pool villas have a huge private pool to each villa plus a day bed and garden. The villas also have access to the beach club pools. 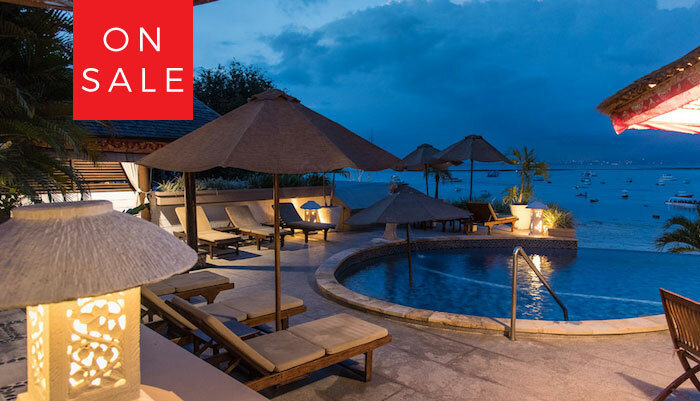 The one bedroom private pool villas can all be inter-connecting for family bookings or large group bookings. Our 5 Days 4 Nights Stay and Dive Package features the best dive sites around Nusa Ceningan, Nusa Lembongan, and Nusa Penida. You will experience a variety of sites and conditions, dive with Mantas, Mola Mola (when in season), drift over colourful reef, and swim along walls. ** Excluded Marine Protected Area fee (MPA daily access fee), soft drinks, alcohol, dive gear, and gratuity. Our 7 Days 6 Nights Stay and Dive Package features our favourite dive sites around Nusa Ceningan, Nusa Lembongan, and Nusa Penida. You will experience a variety of sites and conditions, dive with Mantas, Mola Mola (when in season), drift over colourful reef, and swim along walls. Who is this package for? Age 10 and up. Take your first steps to become a certified diver. This is a full entry certification that allows you to dive internationally. Your holidays will never be the same! Completion of this course allows you to dive to 18m (12m for juniors) with another certified diver. Who is this package for? Age 10 and up. Gain new skills and confidence with a supervised experienced instructor which allows you to dive to 30m. There are two mandatory dives: Deep and Navigation. You can discuss with your instructor which three additional Adventure dives to choose from.